Convenient carrying bag for CH30000 PortaPower Lightweight Vacuum Cleaner. 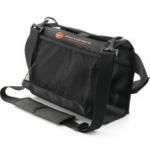 Padded, adjustable waist strap secures the bag to user to prevent shifting from side to side during use. Protects furniture from scuffs and scratches. Designed for left or right handed operation. Storage pouch will hold tool attachments, extra bags and other cleaning accessories. Padded adjustable shoulder strap.